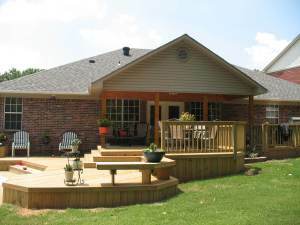 While spring and summer arguably are the best seasons to spend time outdoors on your deck, patio or other outdoor living structure, is it the best time to build your structure? 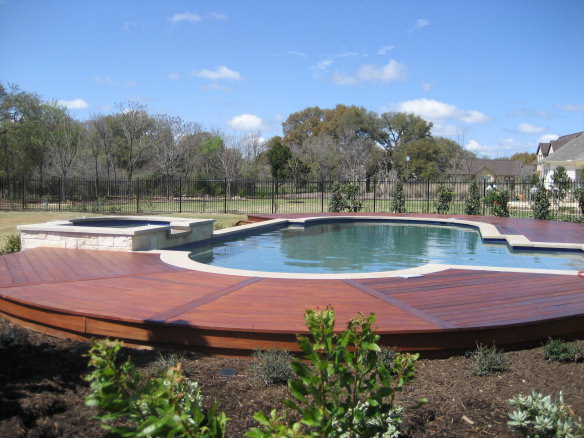 At Archadeck Outdoor Living, we believe there are benefits to building an outdoor structure in the fall months. Spring and summer are our busiest design and building months, but it is also the time when homeowners want to be outside. If you’ve ever had work done on your home, you may know that at times it isn’t safe to be in certain areas. Building in cooler months ensures that you get your project built before, not during the nice weather. The biggest benefit of building in cooler months is that when it turns warm again you have a completed space that you can enjoy. 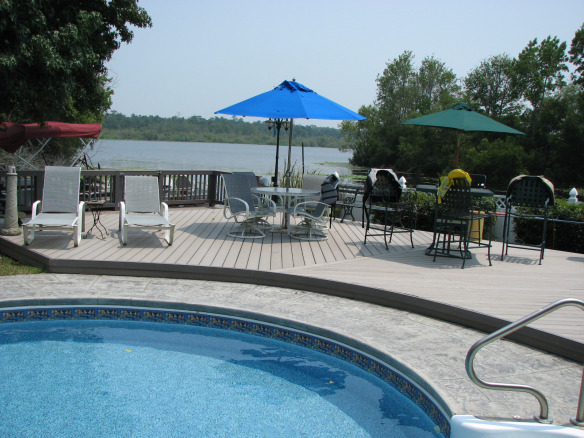 Deck builders and contractors are typically more available during the winter months as the workload gets smaller. This means that the building phase can be done soon after you sign off on a final design and product is purchased. 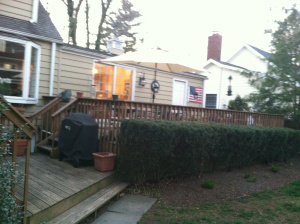 I remember when we had a deck and patio built in our backyard growing up. While the finished project was gorgeous, we were surprised by how the construction phase affected the surrounding areas. It seemed to take months to get everything back to normal. This is less likely to happen when building in cooler months. Plants and grasses go dormant at the end of fall and winter, reducing the amount of damage they will incur. If you are building with pressure treated wood, you may want to consider building in months that have less humidity. 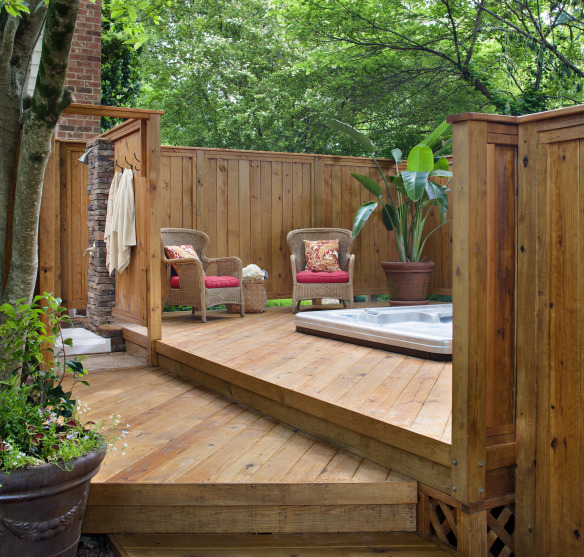 When the air is dry it allows wood to dry and stabilize more evenly than when it is humid out. Wood absorbs moisture in the air and when it is humid, it is more apt to warp or loosen. 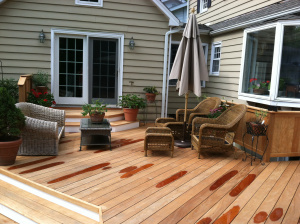 If you do decide to build a wood deck, wait until spring to stain or seal it. Building in the winter will give the wood time to cure, but it won’t be ready to stain until there are several consecutive days of sunshine. 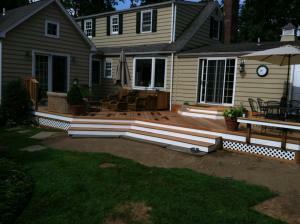 One of the misconceptions about deck and patio building is that it can’t be done in the winter. There may be times when it doesn’t make sense due to weather, but our franchisees build almost all year round. 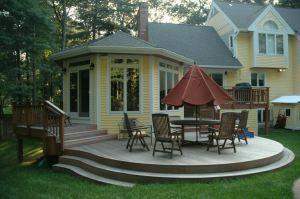 If you have question on building your outdoor structure in the fall and winter months, please reach out to your local Archadeck office. With all the warm weather we’ve been having on the East Coast, more and more people are opening their doors and stepping outside. Spring is less than a week away and it’s now time to prepare your outdoor living spaces for the coming months, including, you guessed it, cleaning. 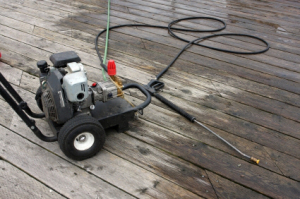 For those who have wood decks, renting a power washer to clean your deck can make a huge difference, but when done incorrectly, it can also result in unwanted damage. We’ve seen some homeowners who had to replace decking boards after trying to power wash their space because they weren’t 100% sure on how to use the machine. The key word is “power.” It’s called power washing for a reason. That thing is strong! Power washers (or similar machines) are used to clean grimy streets and etch bricks so it’s not surprising that it can do a number on your deck if done incorrectly. 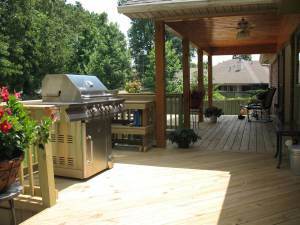 Before using the machine on your deck, take it to an area where you can test it and become familiar with the pressure. A driveway, sidewalk or street will work. The pressure. On most residential projects, you will rarely need a machine that is more than 1500 pounds per square inch. 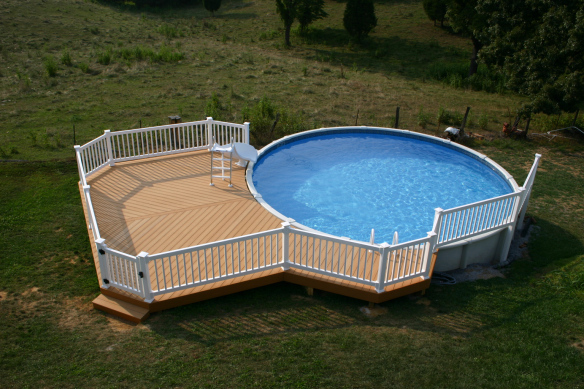 Even that setting may be too much and cause some damage to both wood and composite decking. The only way to tell if the setting is too high is to watch as you clean. If you see more than dirt coming off your deck, turn the setting down. The nozzle. The nozzle of the pressure washer can be adjusted to different angles so it can be used for multiple purposes. 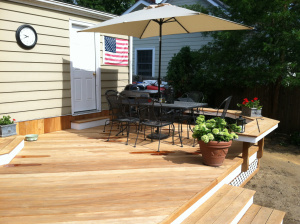 For the standard deck, a 40 to 60 degree fan nozzle setting is best as it spreads out the power over a greater area as opposed to a zero degree setting that would blast your deck too strongly and will damage boards. Also, it is important to be careful and not stand too closely to the area you are cleaning. You should be able to stand comfortably while spraying the area 3-4 feet in front of you. 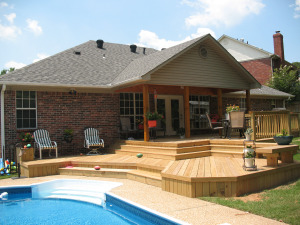 If you are too close to the surface being power washed, you can cause unnecessary damage to both your deck and yourself. The water can bounce back at you if you are too close. Here is a great guide from the Family Handyman on how to use a pressure washer efficiently, effectively and safely. If you have any questions on care or replacement of decks, please contact your local Archadeck office.